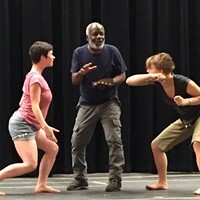 Each year Central Oregon is seeing more and more adaptations of the works of William Shakespeare, with this summer's traveling production of Macbeth and August's fourth annual Shakespeare in the Park from Northwest Classical Theater Company. Under the guidance of Executive Director Grant Turner, this year NWCTC is taking on A Comedy of Errors, Shakespeare's first comedy and what many believe might have been his first play altogether. A Comedy of Errors is a farcical take on mistaken identities: Two sets of twin brothers and class systems; set in Ephesus. Egeon, a merchant of Syracuse, lost one of his identical twin sons and his son's companion (also an identical twin) to a storm at sea 23 years earlier. He has now sent his surviving son and his companion (the other son's companion's twin) to search for them. When they disappear also, he travels to Ephesus (where Syracusians are banned) to search for them and gets in trouble all his own. As the stories of Egeon converges with the two different sets of twins, the play becomes a fast-paced and hilarious comedy of errors, aptly named for all of the constant confusion having so many people looking alike can bring. Performing Shakespeare outdoors, while being a time-honored tradition, can also bring its own set of difficulties in an era of cell phones, loud automobiles, and short attention spans. "What matters to me most is an actively participating audience, and in a theater, one is shut off from various distractions. In the park, one is not!" Director Turner says. "We have to be quite on our A-game to keep the focus on the stage, so that can become a challenge. If a fire truck decides to run through, if a dog is chasing a frisbee, if some kid is crying, if something is floating down the Deschutes River, you know, that can happen, so we have to make sure we are on our A-game in order to keep focus." But an outdoor venue also has its perks. "The performances we do in Bend are on a large stage," continues Turner. "Generally if you are on a large stage you are in a large auditorium. I do a lot of small stage Shakespeare with a small auditorium where the audience is very close and very [accessible]." He adds, "But it's rare that you get to do a large stage production of Shakespeare where the audience is still an active participant. Because you're outdoors and because the sun is up, you're not sitting in a darkened theater, 150 yards away, detached from the action. The audiences in Bend are required to participate and be proactive in the experience. And I love that."